Editor, EQ the Mouse, was browsing through the Best of Quilters Newsletter software (discontinued) and found an article from 16 years ago in which Penny attempts to predict the future of quilting. Mr. Mouse thought it appropriate to share the article since it is now 2010 and that is the year Penny was predicting in her November 1994 article from Quilters Newsletter Magazine. This is the final article in a three-part series on quiltmaking’s past, present, and future. Last month’s segment focused on quiltmaking’s rebirth during the past quarter century. This month we gaze into a crystal ball and predict quiltmaking’s possible and perhaps not-so-possible future. Imagine the future. Pretend it is the year 2010. You wake to NQC, your clock-television’s 24-hour National Quilting Channel. While you breakfast, a friend appears on your computer monitor, calling from Australia. She is chatting about next week’s International Quilters’ Society show. You will both attend. But you will do it from your own homes, watching it all on your computers. Fantastic? Yes, but also feasible. New technology will make many new quilting tools, products, and events possible in the coming decades. New sewing machines, new computer software, and new ways of sharing quilting information will all become commonplace. These innovations, while exciting, will bring change. And change can sometimes seem unsettling. So before we jump ahead, let’s consider how far we’ve come already. Think of once-high-tech wonders that are taken for granted by quiltmakers today: sewing machines, electricity, photographs, telephones, airplanes, photocopy machines. Today’s quilting industry couldn’t exist without them. Yet, these marvels were all intimidating at first. The sewing machine, for example, so frightened one 19th-century quiltmaker that she declared it “the work of the devil.” But this new invention actually gave fresh life to quilting. It didn’t replace hand sewing. It simply gave women time to do hand work when they chose to. Today’s computer technology will also benefit quilting. By encouraging the development of innovative quilting products and tools and by attracting younger generations to quiltmaking, it will add another chapter to quilting’s history. 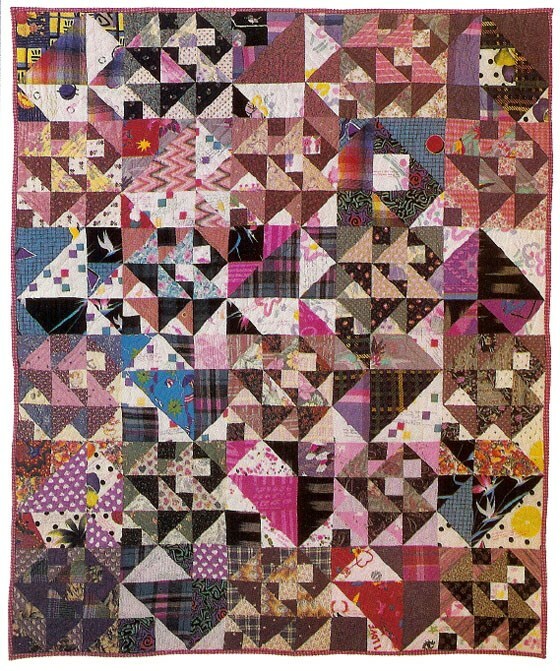 IT’S ONLY ROCK AND ROLL, 56″ x 68″, by Nina Antze: This cotton quilt was designed in 1986 using PCQuilt software. 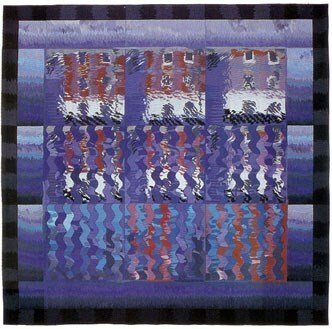 Ten years ago, in order to use her new computer for designing quilts, Nina Antze became a computer programmer and wrote PCQuilt, one of the first programs made especially for quilt designing. 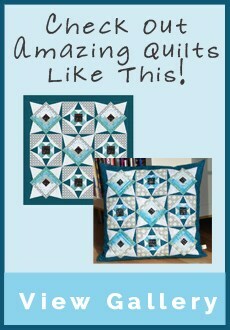 This quilt, a variation on the Card Trick pattern, helped launch an entirely new quilting industry: quilt-design software. Says Nina about a computers potential for the future, “Computers are just tools. They are not going to give you the answers, they are just going to stimulate you to find your own answers.” Photo by Mellisa Karlin Mahoney. The new term CD-ROM stands for Compact Disc, Read-Only Memory. A CD-ROM disc is similar to a music compact disc. But unlike a music CD, a CD-ROM can store video, text, and animation as well as sound. When you play a CD-ROM disc on a computer’s CD-ROM player, any information stored on the disc shows up on your computer monitor. Imagine some possibilities. Consider what computer CD-ROM technology can offer, for example. A single CD-ROM disc can hold huge amounts of information—not only text, but stereo sound, color graphics, and full-motion video clips as well. This means quilt books may one day come alive on the computer screen: talking, playing videos and music, and giving us design lessons as well as providing patterns and instructions. Visualize the wonders of a future CD-ROM “book” about Log Cabin quilts. Perhaps you would select from a variety of Log Cabin-related topics on the computer screen. Imagine starting by selecting “History-English.” Perhaps you would see lovely antique English chintz-and-plaid Log Cabin quilts on your screen. These images might gradually meld into an English landscape, with a bird’s-eye view, as a narrator’s voice compares the light and dark block sections to a plowed English field, half in sun, half in shadow. Perhaps you would select “Strip Designs-English.” Then you might see a mini-tour of London’s Victoria & Albert Museum, viewing textiles and tiles done in strips. “American History” might bring you vintage photographs of old midwestern log cabins and quilt historian Julie Silber, reading 19th-century women’s diary entries. “Construction” might offer a choice of workshop videos; perhaps you would choose to see a strip-piecing demonstration by Michael James. Whenever you wanted, you could ask the computer for more information about terms used. 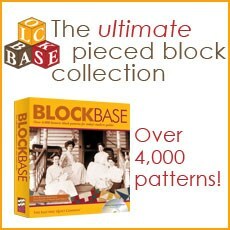 Ask about “pressed piecing,” for example, and you would immediately find diagrams and instructions printing out of your computer’s printer. 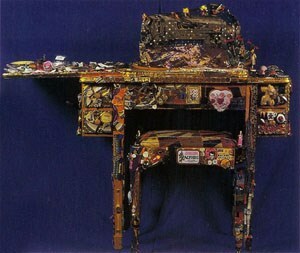 MY FIRST SEWING MACHINE, Terrie Hancock Mangat, 1993, embellished Singer sewing machine, from the collection of The Electric Quilt Company, Bowling Green, Ohio. Will old sewing machines be enshrined as works of art in the future? 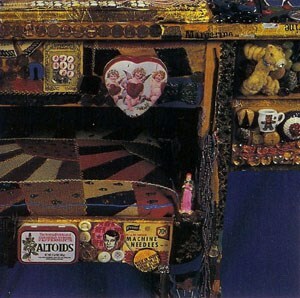 Terrie Mangat turned her well-loved, old sewing machine into an object d’art by embellishing every surface with family trinkets and memorabilia as seen in the detail on top. Yes, it still sews. Photo courtesy of Terrie Mangat. The possibilities for CD-ROM discs and computer programs are limited only by our imagination. CD-ROM discs could show us new fabric lines released each spring and fall by fabric manufacturers. We could preview new colors and prints on our computer screens, auditioning them in quilt designs before yardage was cut or a stitch was sewn. Imagine how future quilt historians could benefit if independent and state quilt project research findings were put onto CD-ROM discs. So much valuable quilt research is inaccessible today. Few people, for example, know of the rich lode of quilt lore recorded on 22,000 note cards located in a home office in Petaluma, California. This office is the headquarters of a passionate quilt detective named Joyce Gross, who has spent decades filling gaps in quilt history. Joyce is a saver. Everything to do with quilts-—exhibition catalogs, newspaper clippings, magazine articles, quilt postcards, correspondence, you name it-—not only is saved, it is indexed on note cards. Today, to mine her information, you would have to head for Petaluma. Tomorrow, perhaps you could browse through her files in your own home, via computer. 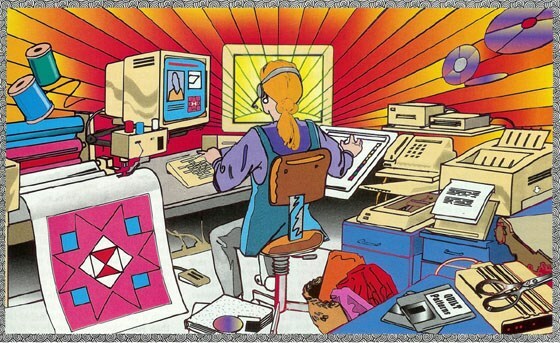 As a pioneer developer of quilt-design software, Nina Antze realized computers’ potential for quilters early on. “I really like designing my quilts ahead of time,” she says. “So when I got a computer in 1984, it seemed as though it would be perfect to use for designing.” She searched in vain for IBM-compatible quilt-design software. Still eager to design on-screen, she decided to make it happen the hard way, by creating her own software. She taught herself how to program, and in 1986, she finished PCQuilt, her own quilt design software. Today her software, in a much updated version, is available to quilters from her Sebastopol, California, company. Nina is still programming when she is not making quilts. As computers become more portable, less expensive, and easier to use, they may well become familiar tools in quilt design classes, predicts Carol Gersen, an artist and teacher from Boonsboro, Maryland. “Using a computer would take away a lot of tedium,” she says, describing how long it takes her students to draw block value studies by hand. Carol envisions students quickly duplicating block variations using computers rather than pencils and photocopy machines. 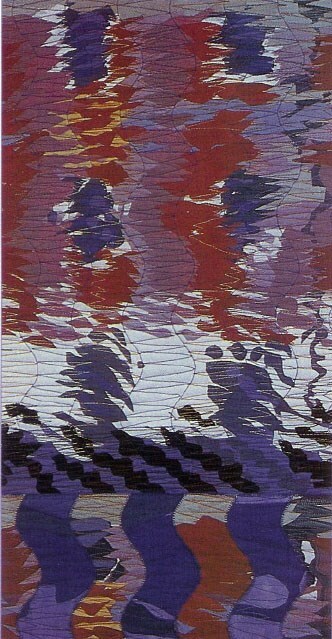 NOTTINGHAM REFLECTIONS, [full view and detail], 80″x 80″,by Pauline Burbidge, 1994. Cotton and silk, machine appliqued and quilted, from the collection of John Walsh III. Will future sewing machines allow quilters to machine quilt more freely than ever before? To make this quilt, English quilt artist Pauline Burbidge used both her home sewing machine and large industrial multi-needle machines. Perhaps future home machines will include features found today on factory models. Photo by Keith Tidball. Coffee? Tea? Computer? You’ll fly the user-friendly skies before long if Boeing has its way. The airplane manufacturer will build computers into each seat back in new model 777 jets, which are scheduled to be available next year. United Airlines has already ordered 34 of these new planes, meaning quilters may soon design and chat on-line even in midair. Sewing machines are becoming increasingly sensitive to our wishes and needs, thanks to built-in computers. Hoquiam, Washington, writer Gail Brown, an authority on sewing-machine innovation, predicts future machines will have the same differential feed currently available on sergers and industrial models. These new machines will be able to prevent puckers or stretching of fabrics fed under the presser foot. New machines may also increasingly become creative surface-design tools. “What I can see machines doing is making it more possible to paint with thread,” says Gail as she envisions new trends in intricately machine-embroidered and embellished quilts. Her dream machine would change thread colors automatically. “I would like to be able to digitize and output a design in color within the sewing machine, and then see the same color automatically being sewn right out of the machine,” she says. Many of these new ideas and products will arrive right at your doorstep, over night, through ever-more-efficient mail order systems. Mail order is a $200 billion industry today, and it is sure to grow as more people recognize catalog shopping’s convenience and product variety. This industry will change more as it moves into CD technology. “A CD-ROM disc will never replace the fun of having a catalog you can take into your bath to dream over, but it would be nice if we could have both real and computer catalogs,” says Judy Sabanek, president of the Centre Harbor, New Hampshire, company whose Keepsake Quilting catalog reaches quilters worldwide. To compete with mail order, quilt and fabric stores might expand their customer services to emphasize instruction and fun. Imagine visiting a quilt shop for in-depth design consultations. What if you could schedule an hour consultation and not only get help with fabric selection, but also go home with ideas for room color schemes and furniture placement? Perhaps quilt stores will make computer instruction as readily available as sewing machine instruction. What would be more comfortable for quilters than taking a class called “Computers Without Fear” at their local quilting store? Future quilt shops might also play up the social benefits of quilting, offering a wider range of classes, meetings, and field trips. As more quilters work in home offices, they will look forward to getting out and meeting with friends. “We’ll go to stores, not because we have to, but because we want to, for the socialization of it,” says Ronald Ahrens of Bristol-Myers Squibb, predicting the role of stores in the future. According to marketing experts, customization-—gearing products to individuals, rather than to general markets-—will be increasingly demanded by consumers. This means quilting stores will either need to stock huge inventories or find ways to customize products right in the store. “What about an in-store computer that could print out fabric patterns?” wonders Jason Yenter of Seattle’s In the Beginning Fabrics. He good-humoredly imagines future customers selecting color and print settings on a computer, then printing their choices directly on fabric using giant color printers. “It would sure solve inventory problems,” he says. “Instead of storing bolts of individual fabrics, you would just buy a lot of white and let customers print their own.” While we are imagining, why couldn’t stores satisfy multiple needs with one stop shopping? Picture a shop called Kids, Quilts, and Quiche. How perfect to shop for both fabric and dinner while your children take a crafts class. THE FUTURE QUILT STUDIO?, computer-generated illustration by Craig Fisher. A quilter is enjoying an interactive video while working on a digital drawing tablet. The sewing machine interfaces with the computer. Some things will never change, though: A basket of fabric is still prominent. Which of our predictions will prove fantasy and which fact? It’s too soon to tell. Nothing has been decided; we still have a say. We will all affect quilting’s future development, by the quilts we make as well as by the new quilting tools, articles, classes, or services we request. Our requests prove a need, and this need suggests a possible market. And unless manufacturers sense a market, any great idea will remain only that. One thing is certain. Quiltmaking will change, because change is a constant in any living art form. It doesn’t mean an end to quilting as we know it; it promises new beginnings. These new beginnings will keep quilting in tune with the times. As writer Anne Morrow Lindbergh put it, “The wave of the future is coming, and there is no fighting it.” So get ready to influence and welcome quiltmaking’s exciting new future. Penny McMorris is an art consultant and television producer who lives in Bowling Green, Ohio. She is the art curator for Owens Corning Fiberglas Corporation and a partner in The Electric Quilt Company.